The Picos de Europa is Spain's only National Park that has wolves within its boundaries, although that doesn't mean they're completely protected. This year, as in previous years, a population control will be carried out. At least this year the Park will have a better idea of exactly how many wolves they are dealing with. The most thorough census todate of the wolf, Canis lupus signatus, population has been made, during the last couple of years, leading the park to give an estimate of 5 packs within the park and its immediate surrounding areas. Of these family groups they estimate that each consists of between 5-9 family members, giving a minimum of 25 and maximum of 45 individuals, not including the few probable loners. These figures are far below those claimed by local farmers. Worryingly, or not depending on your point of view, no signs of wolf activity were found in areas where previously there has been; Amieva/Dobra in Asturias and San Glorio on the border of Cantabria and Castile-León for example. The four regions where wolf presence has been confirmed are Valdeón (León), Covadonga Lakes (Asturias), Fonfría (Cantabria) and Cabrales-Tresviso (Asturias-Cantabria), all areas of the Picos where dairy cows, sheep and goats pasture to produce cheese. Claims for livestock losses are on the up, rising to 73 head last year although not all the deaths could be positively attributed to wolves. I wonder to what extent the recent illnesses, including sarcoptic mange, that have been affecting the rebeco (chamois) could also be affecting the amount of predation on domesticated grazers in these particular areas? Anyway, the good news is that promises have been made to make prompt payments for livestock loss within 20 days, instead of the more usual 20 months. Just to the south in the Picos de Europa Regional Park, whose territory overlaps that of the National Park, hunting reserves are mainly for Wild boar, Red and Roe deer, the cotos de caza coming under the jurisdiction of the regional Castile-León government. 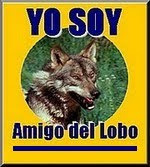 Using their last census of 2001 which gave between 40-50 wolf packs in that area, they have given permission (hunting wolves is legal north of the river Duero) for 42 wolves to be shot this season. Last year the limit was 29. With hunters willing to pay around €10,000 for a permit to kill a wolf at auction, that's well on the way to half a million euros in income for the municipalities involved. As the top predator in this whole chain of course, the bigger the trophy the happier the hunter. Apart from probably further fragmenting the wolf's territory, are we not also creating a genetically weaker predator less able to help contain numbers of other, potentially habitat-damaging, wild ungulates? Red deer populations have been proliferating recently. Back in the National Park pressure from the farming lobby causes the authorities to periodically cull in problem areas. Farmer-hunters are generally involved in these hunts, an added palliative measure perhaps that may help to stop the laying of poisoned meat, a practice that still continues today and that is holding back reintroduction programmes of other species. (See Picos, Palencia and Poison). Management of the Picos de Europa National Park is about to be de-centralised, control changing from central government to the three autonomous regions with territories within the National Park; Castile-León, Asturias and Cantabria. Ecologists fear even more unjoined up conservation policies over an area where wild animals roam freely with no understanding of limits and boundaries.